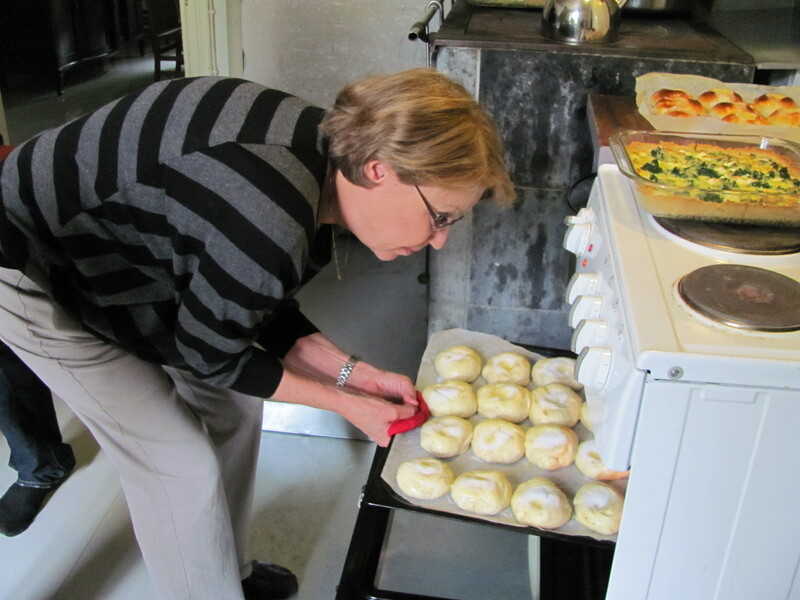 Home-baked pulla - the best! Stormy, rainy, cool weather across many parts of Vermont these past few days. Attempts to be outside during infrequent sunny spells were quickly thwarted by severe thunder and lightning, rain and even hail. Today it is overcast, after a day and night of steady rain. 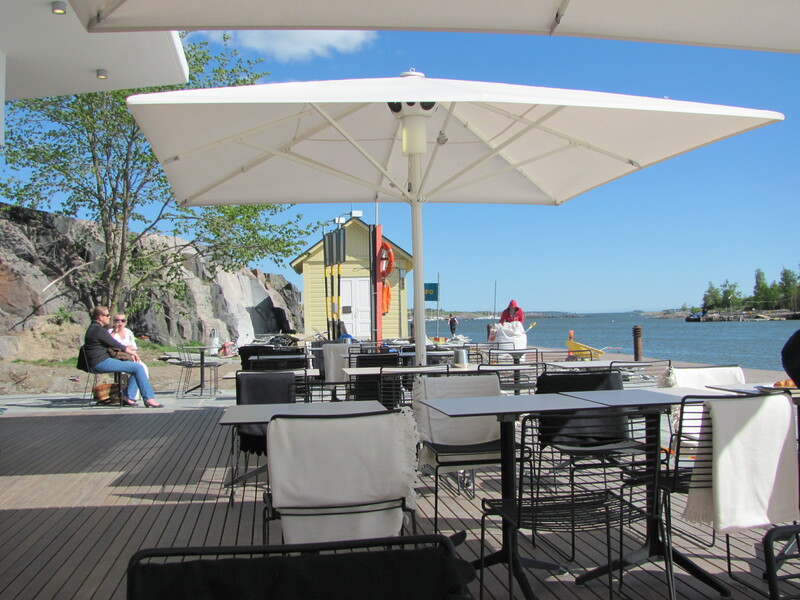 A little bit like the changeable weather we experienced in Helsinki in May, when charming summer pop-up cafes would appear out of nowhere when the sun was shining, only to be shuttered again during rainy spells. But cafes are plentiful in Helsinki, whether seasonal or year-round. And often mere steps away from each other – in parks, shopping centers and museums, along the sea – whenever and wherever the need for refreshment might strike. Most serve really good coffee and fresh-baked pulla – sweet cardamom and cinnamon rolls – along with light lunch and dinner fare. And though not an inexpensive indulgence, cafes are a relatively reasonable alternative to more expensive restaurants, and provide a true taste of Finnish food and culture. Here is a sampling of cafes that my time and budget allowed – all well worth a stop – rain or shine. 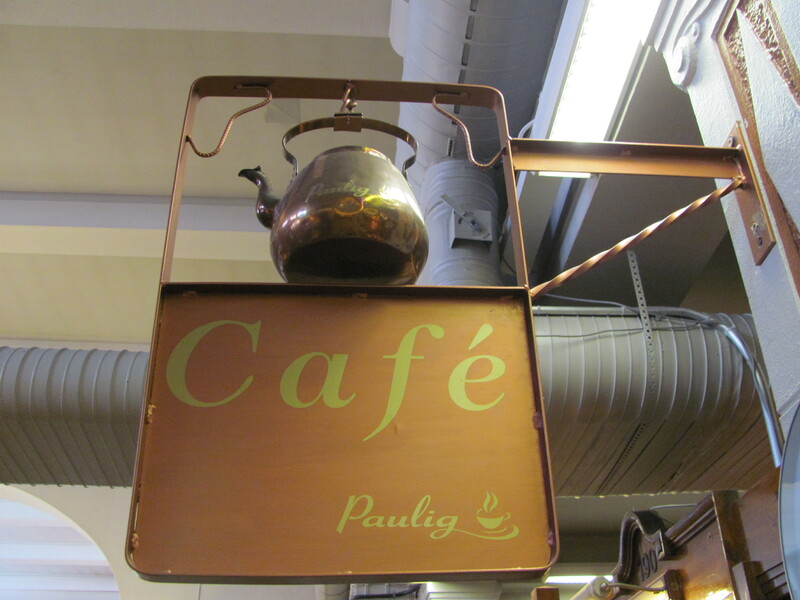 Upstairs in the Hakaniemi Market Hall sits a cozy café, where I enjoyed – on the advice of a friend – an especially fresh pulla and cappuccino one rainy morning while food shopping. A popular spot, with a long line snaking around the corner, tables packed full, I sat at the only available table – usually reserved for the president of Finland. 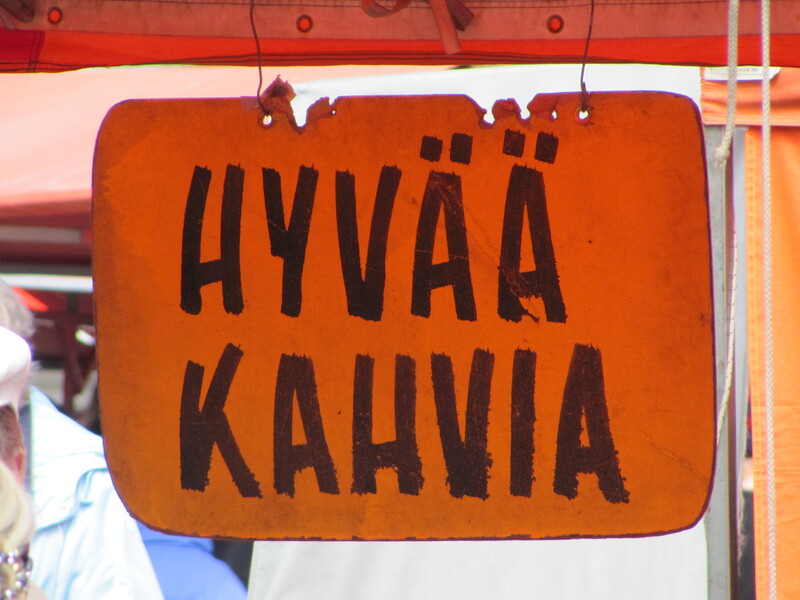 During market hours, rain or shine, the tent cafes at the Hakaniemi Market and the more central waterfront Market Square serve a good light lunch, rice porridge, or coffee and pulla, and provide a great vantage point to watch a bustling market in action. On a late afternoon walk across town, gray skies and a chilly seaside breeze lured me inside the red seaside cottage that houses the Regatta Cafe. Tiny, and crammed to the gills with knickknacks, customers shared tables and squeezed in together to enjoy super delicious warm cinnamon rolls with hot coffee and tea. Outside, a spillover crowd braved the cooler weather and the ubiquitous pesky seagulls, empty café chairs at the ready for the next wave of sunshine. 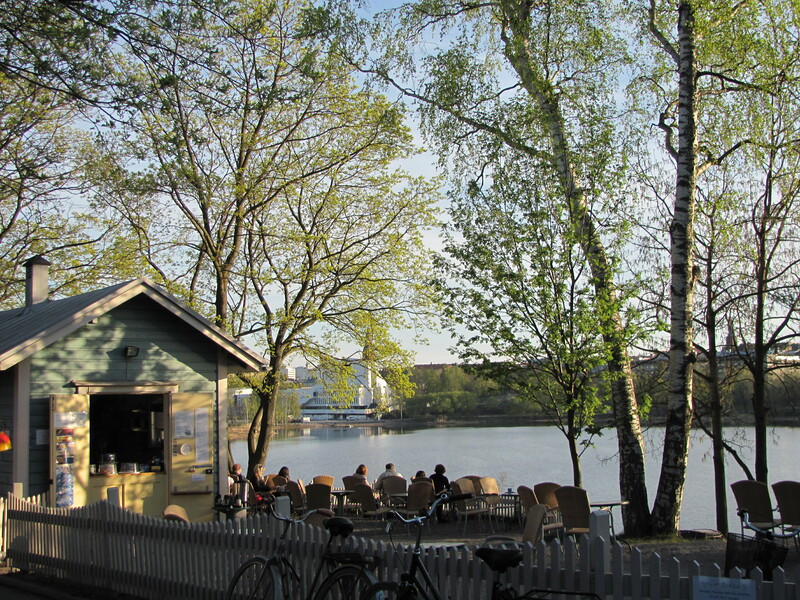 On yet another walk, this time on a sunny afternoon, in the Kaivopuisto area, I came across the Mattolaituri Cafe. A dose of heaven in warm sunshine, right on the walking path that curves along the coast. New, with a patio still under construction, and an amazing view out to the Gulf of Finland. If the sun was shining, and the tables were set out, we could count on a yummy espresso pit-stop at the little park café on our way home. 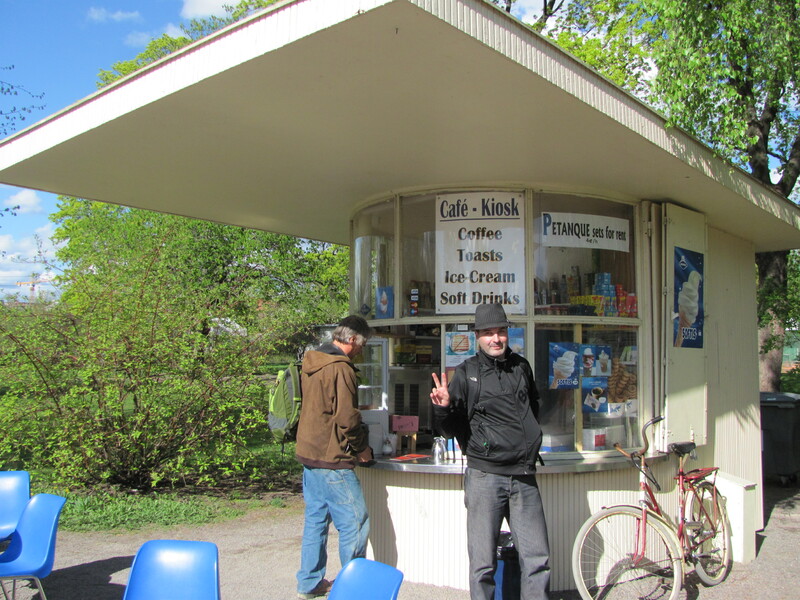 We called it the Kioski Cafe. A stone’s throw from the many cafes located in Helsinki’s Central Railway Station. One afternoon I was caught downtown in the pouring rain. 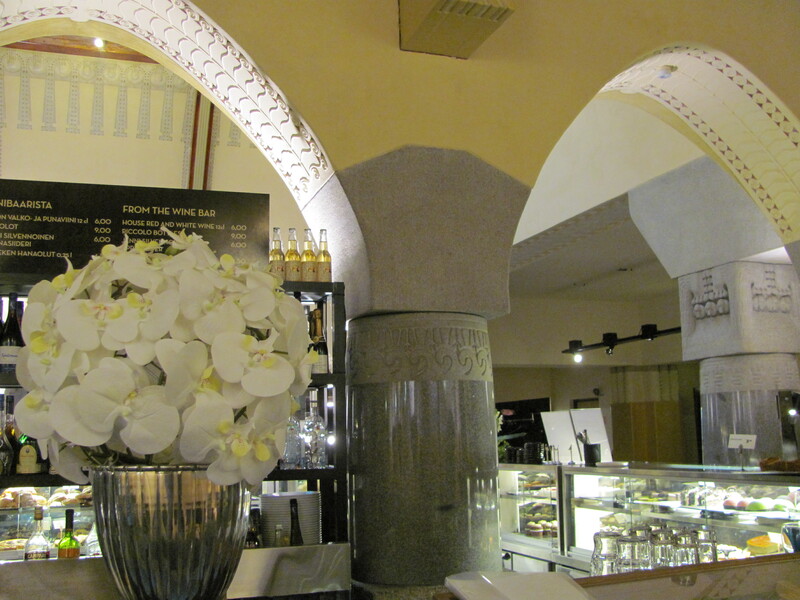 The Aschand Jugend Cafe had long been on my list, and turned out to be a great spot for tea, wifi, reading brochures, and for seeing a historic, jugend-stil, Finnish Art Nouveau style interior. And it was conveniently located adjacent to the Helsinki Tourist Office – a veritable mecca of free, beautifully designed brochures. Irresistible on a rainy afternoon for this brochure addict. And by the time I emerged an hour later – fortified by tea and information – the sun was shining again. Last but not least – the Blue Villa Cafe. 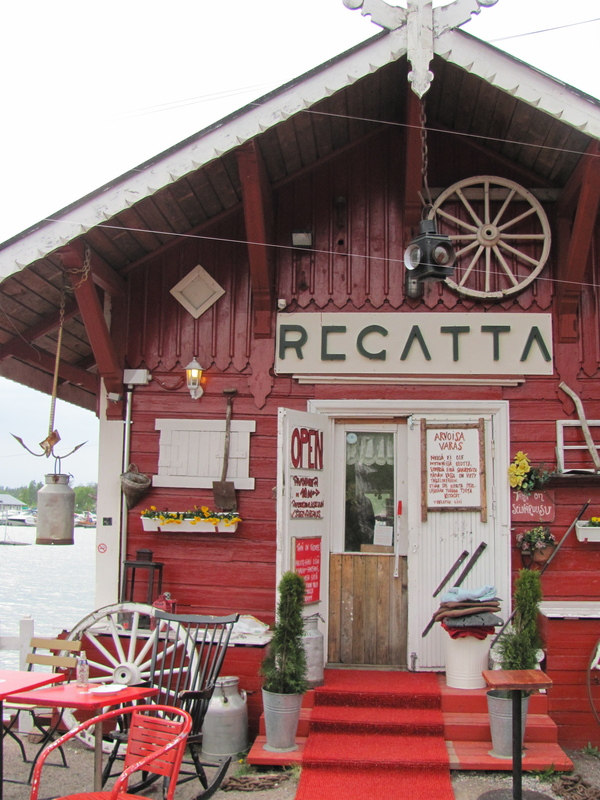 Close to our home-away-from-home in the Linnunlaulu area, this was our favorite café for a light supper, or a late evening espresso or tea, and for sitting outside, and watching the Töölönlahti waters shimmer in the lingering sunlight. A delicious treat, this little café is open only during nice weather, there is no inside seating. Inside or outside, I experienced without fail super friendly staff and efficient service at all the cafes I visited. And with very few exceptions, cups were the real thing – thankfully not paper. One note of warning – don’t feed the birds! With all the outside eating going on – it is illegal – for good reason. Also, if you are not a smoker, be aware that outside tables have upside down clay-pots – ashtrays – on them for a reason. And – if there is a chill in the air – most cafes offer fleece blankets to keep you warm and cozy. I’d be hard pressed to decide on a favorite, and there are many I did not get to try. Though by far, I experienced the absolute best coffee time at the home of dear friends, where the pulla was home-baked and still warm from the oven, enjoyed around the table on their sun-lit porch, conversation and laughter flowing freely. And there are even new cafes opening. Marikahvila, a new collaboration between design maven Marimekko and the Strindberg Cafe (shuttered for renovations while I was there in May) will be opening soon at Pohjoisesplanadi 33, in Helsinki. Always glad for another reason to return to beautiful Helsinki. But until then, I will have to bake my pulla, in my own small kitchen. I love the coffee culture in Helsinki. I have been to several of the ones you have suggested and will most definitely try the others. My mother used to make pulla occasionally. Hi Debra – thanks for stopping by my Helsinki posts – it is such a wonderful city for walking and exploring on foot – especially with such a plethora of fabulous coffee shops. 🙂 You are fortunate to have the chance to visit there regularly. Good luck with your new Helsinki blog. I love Helsinki. I go about 4 times a year, on my way to and from Italy. I love it there. How wonderful collection of cafés! I love this post, it is so lovely. I think that next summer I must make a tour of cafés also. BTW, I jus started my Helsinki photos. The series will last until the Christmas.